Before introduction of the Open Graph, a users interaction with a company or App was limited to the “Like” action (“David Likes Nanigans”). The Open Graph allows App developers to define and integrate any actions to their Apps, such as “reading,” bought,” “want” or more brand unique actions such as “pinned.” When users take actions within Apps, they are shared in multiple places on Facebook: the Ticker, Timeline, and Newsfeed. On the advertising front, these actions will soon be targetable. Washington Post’s Social Reader, one of the original Open Graph Apps announced at f8, has been highly successful in generating a large readership. Users install the application, and everything they read is posted to the Newsfeed, Ticker and Timeline. 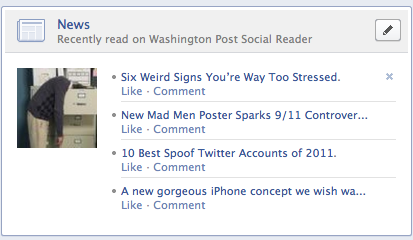 The Ticker also alerts friends that the user is “using” Washington Post Social Reader. Another original Open Graph App, Spotify publishes the listening activity of a user into the Ticker, Timeline and Newsfeed. This groups Friends who “listen” to the same artists, songs or albums together. And it’s fast becoming one of the best ways to discover new music through your friends. A leader in social commerce, Fab has taken it’s social shopping one step further by offering members $10 worth of Fab.com credits a month to activate their Facebook Social Shopping App. The App automatically publishes member purchases to their Timeline, Newsfeed and Ticker. This uses the action “bought.” We love what Fab is doing—rewarding its members for their word of mouth marketing capabilities. 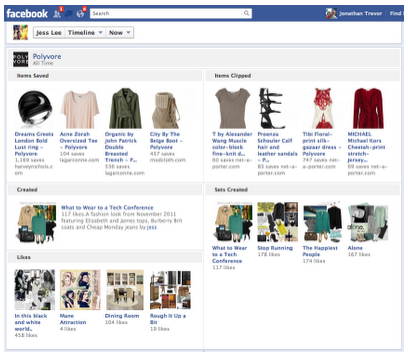 One of the leading e-commerce solutions for Facebook, Payvment has just updated their Facebook App for the Open Graph. Users are encouraged to now ishare what they “own” and what they “want” via the App. It’s a great way to generate conversations not only around products, but also the company. Ticketmaster, seizing on the power of word of mouth to spur event sales, launched a Open Graph App which publishes events users “want to go to, “recommend,” “attended,” and “RSVP’ed” to. 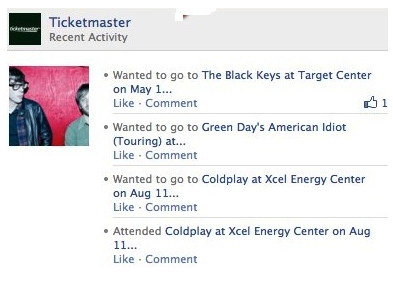 This re-affirms Ticketmaster’s commitment to Facebook, whom had already added a feature to their ticketing service which shows where Facebook Friends are sitting. The ticketing service also detects what the user has “listened” to on other Open Graph Apps, making recommendations based on this for upcoming events. AirBnB, a leading network for accommodations offered by locals, increased their Facebook presence through their new Open Graph App. The company now allows people to register and sign in through Facebook. From there, AirBnB personalizes the search results according to their Facebook network and how they are connected to the hosts/reviewers. 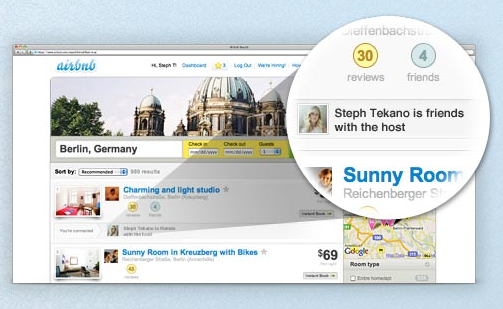 Additionally, AirBnB will publish the places the user has “stayed” and “visited” to the three Facebook news channels. Polyvore, a shopping and e-commerce store, has made their mark on retail by turning online shopping into a much more social experience. They did this through the enabling of the Open Graph platform to allow users to “Like” and “create” sets and collections, and “clip” and “save” items. These actions in turn are published on Facebook’s three news channels. 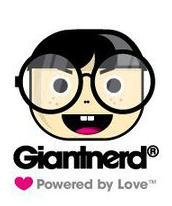 GiantNerd, an outdoor gear and apparel retailer, has taken a similar track to Payvment: instead of focusing on what customers are buying, they are prodding users to state what they “love,” “want,” and “own.” This in turn is published to Facebook’s three news channels, and introduces new brands to the Facebook conversation. The social buying site, Sneakpeeq is another company using the Open Graph well. The idea behind Sneakpeeq is that users only see product prices (which are well below retail) if they are interested in it. 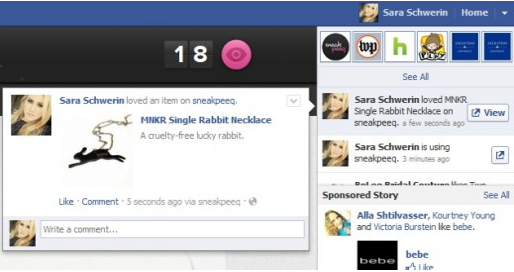 Similar to Fab, Sneakpeeq has recognized the importance of keeping customers talking about their experiences and has incorporated prizes and savings for people who continuously share on Facebook. Users activity which include: “earning” badges and discounts, “loving” a product, and “peeqing” at a price are all published onto Facebook’s news channels to encourage conversations and brand awareness. The Textbook rental site has come out with a new service aimed at capturing a larger audience of students, and increasing the conversations. 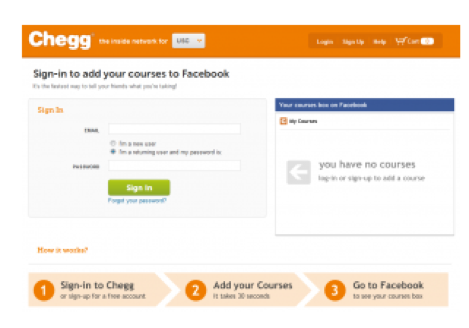 Using the Open Graph platform, Chegg created Chegg my Courses — an App which gives students the ability to “share” courses they are taking with friends and “create” online study groups. These are some of our favorite Open Graph Apps. Which are yours? Let us know in the comments!